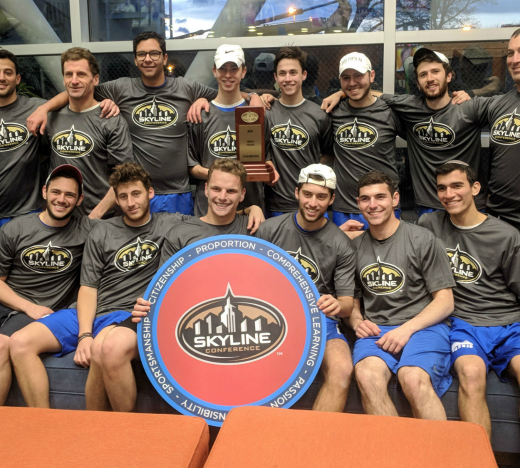 The Yeshiva University men’s tennis team continues its dynasty, as the No. 1 Maccabees knocked off the No. 2 Mariners of the United States Merchant Marine Academy on Sunday evening to capture their fifth consecutive Skyline Conference championship. The final score was 5-0. The Macs also earned an automatic bid into the NCAA Division III tournament. Junior Adam Rosemblaum was named the Most Outstanding Player of the Skyline championships. Senior Charlie Friedman and sophomore Avidan Rudansky kicked the match off with a convincing win at #3 doubles, 8-1. Junior Mikey Ozery and freshman Dor Gutterman continued YU’s momentum with an 8-4 victory in the second doubles position. Junior Adam Rosemblaum and sophomore Lior Brik wrapped up doubles play with a win at the first flight, 8-4. In singles play, Rosemblaum dominated in the first position, 6-0, 6-1. Brik clinched the championship and Yeshiva’s fifth straight bid into the NCAA tournament, by winning every game in his fifth singles flight. In the unfinished matches, Ozery won the first set at #2 singles, while Rudansky won the opening set of the sixth position. The Macs will find out their first-round opponent and location on Monday, May 7, when the NCAA releases a press release featuring the bracket, at 12:00 p.m.